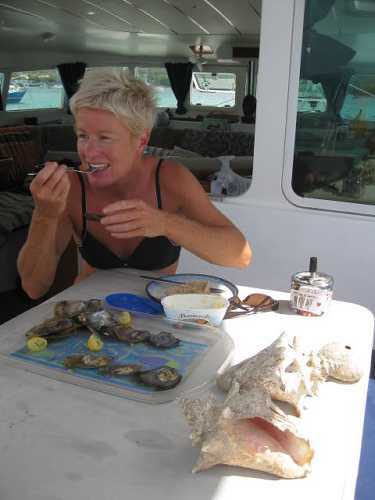 So here we are, having had a wonderful sail on Tuesday 26th, for about six hours, north from Port Louis, St Georges, Grenada, and have dropped the anchor in Tyrrel Bay, Carriacou (pronounced KarryKoo), it just gets better and better. We decided to hug the little-explored north coast of Grenada to take advantage of the spectacular views, and watched all the other yachts heading straight across, but they missed a treat. Unfortunately photographs don’t do the scenery justice, so you’ll just have to take our word for it, but a little bonus was that because we did the required “easting” while being sheltered by the land, we had a good beam reach all the way up and made better time than the other boats who headed straight up and then had a nasty bash across the channel, and we saw a few giant turtles resting on top of the water, taking what look like lots of little sips of air before plunging down into the deep blue. 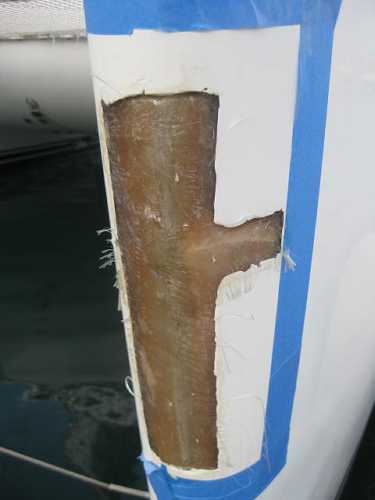 Our time in Port Louis was well spent, and at last the nasty crack in Talulah’s bow has been properly repaired. After chipping away the cracked gelcoat (the white stuff), a few layers of grp (fibreglass) were added (inside and out) then fresh gelcoat was spread over the top of that, and sanded down and polished. We’re delighted with the result. She looks as good as new, and is even stronger than she was before. Another thing we sorted out is the watermaker. It is now working perfectly! It’s always made good water, but it’s placed a lot of strain on the generator, causing weird voltage fluctuations. After asking around fellow cruisers and doing some investigation work and lots of owners manual reading, it transpired we didn’t have enough capacitors to do the job properly (I mean honestly, how on earth is any normal person supposed to know all this stuff?!). So anyway, a stroll around town revealed a tiny electrical store who just happened to have a capacitor of the right size (in the Caribbean!! ), a few connections later and “hey presto!” The learning curve is steep my friends, it’s very interesting (really!) and it never ends. We also changed our main halyard (the rope we use to haul the mainsail up with) again. We did it last in Portugal, with one we bought in Blighty just before leaving. It turns out we were “stitched right up” and were sold the wrong line for the job, and so our super-soft, kind-to-the-hands line has been replaced with new tough stuff and seems to work very well. No wonder we had such problems with it on the Atlantic crossing. We took time off boat work before we left Grenada to catch a bus one evening (a hairy ride up half built roads along the east coast) to Gouyave for “Fish Friday” – fishermen and vendors sell all kinds of cooked fish, from fried fish patties to lobster, from their stalls … with rum in hand, and a tummy full of fish, the evening turns into a bongo drumfest, with some great dancing ….. On Monday 25th we left Port Louis and it felt so good to be anchored out again, feel the breeze, (outside St George’s) and we spent the evening catching up with a few friends anchored nearby. 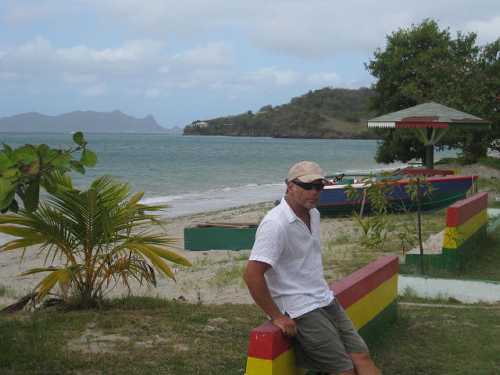 So now we have been anchored off the island of Carriacou for a couple of days. Its gusting away, the pelicans are having a feast from the nearby reef, we have dinghied up to the Lazy Turtle bar, taken a bus into Hillsborough, the main town, and made more sun awning for the bimini (to get more shade in the cockpit). The inhabitants are either farmers, fishermen or seafarers, and its lovely to see goats and chickens running around. Every few hours a wooden fishing boat will pull up to Talulah and offer wine, rum or fish from their boats. Our first morning Roberto brought us some mangrove oysters which he picked from the mangrove swamps only a few hundred yards away. As he sat tied alongside, we gave him some rum and for an hour listened to his great tales as he opened our delicious oysters and gave us some limes …. Wow, what a breakfast we had !!! 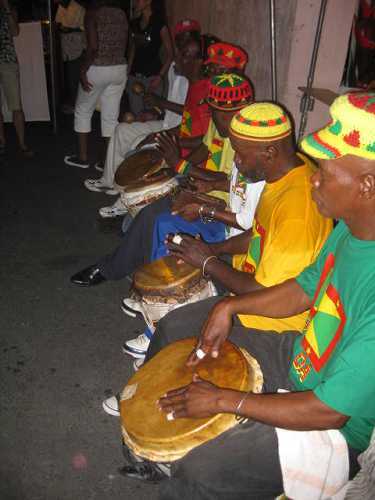 “Feelin’ da ryddim” Bongo drummers at Fish Friday in Gouyave, Grenada. 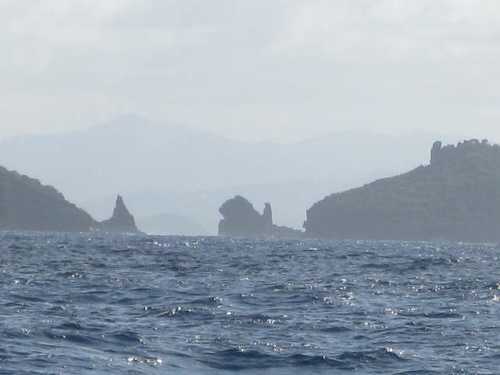 Dramatic Islands, on the passage between Grenada and Carriacou. 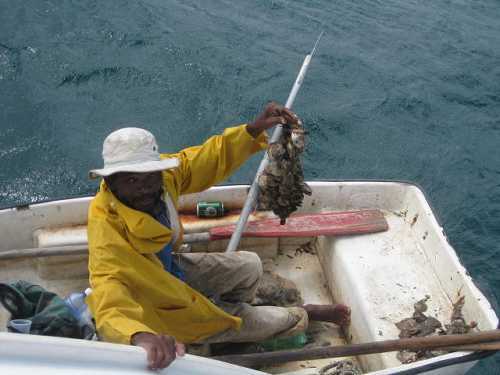 Roberto, the mangrove oyster seller proudly displaying his wares.